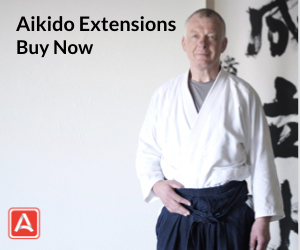 Haruo Matsuoka holds the rank of 6th dan in aikido and has over 40 years of aikido experience. 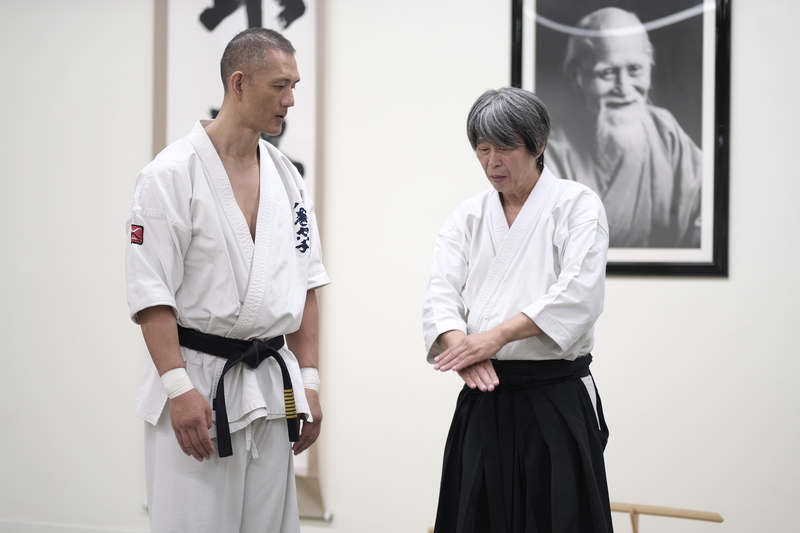 Matsuoka is chief instructor at Ikazuchi Dojo in Irvine, CA and Culver City Aikido in Los Angeles, CA and has over 75 actively practicing yudansha (black belts) around the globe. 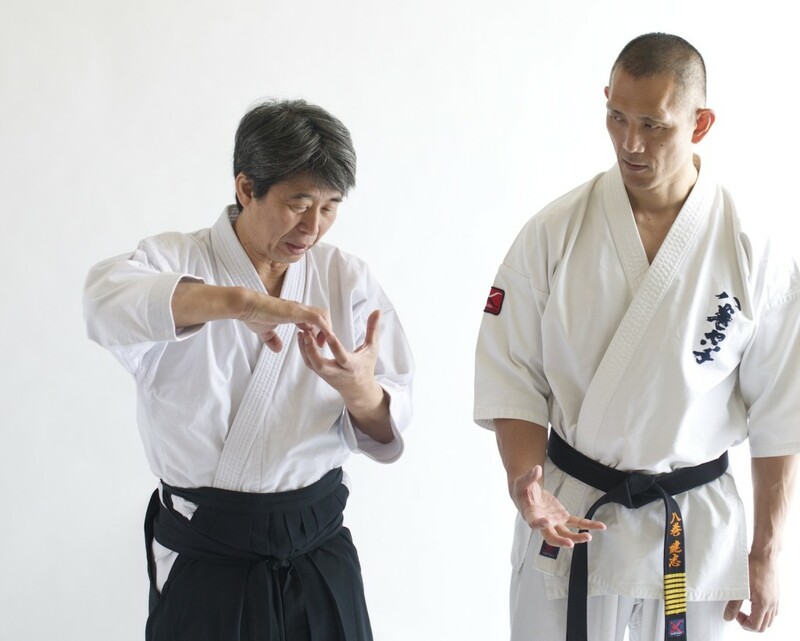 Matsuoka’s active pursuit of cross-training and knowledge exchange programs with masters in other martial arts lead him to continually deepen his understanding of movement principles and movement quality. Kenji Yamaki is the founder of Yamaki Karate and was the 1995 Kyokushin karate world champion. He is also one of the few to have successfully faced the 100-man kumite challenge devised by Mas Oyama, the founder of Kyokushin. In addition, Yamaki won the title of All-Japan Karate Tournament Champion in 1989 and 1994. Matsuoka and Yamaki sat down after one of their monthly training sessions last fall to discuss the insights that have changed their understanding of their respective disciplines and the benefits of cross-training. Haruo Matsuoka: Thank you for joining me for this conversation today, Yamaki Sensei. 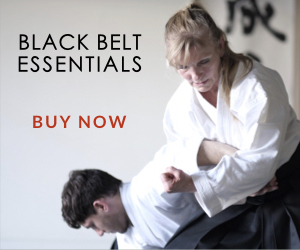 You’ve achieved the highest level of success in one of the world’s most physically brutal martial arts. How has your karate changed since your championship days? Kenji Yamaki: I’ve actually changed 180 degrees. Back then, I was very physical and my entire focus was to be number one in the world. I built confidence through competing, gaining experience, and building muscle. Muscle was my main focus. I trained until I could squat 675 lbs (306 kg), deadlift 630 lbs (286 kg) and bench press 500 lbs (227 kg). I built a kind of muscle armor to withstand getting hit from any position. Also, I let people punch me often at practices, relying on my muscles to take the force. Now, I’m more focused on researching kokkaku (connection through the frame of the body). I still do weight training, but it’s primarily to maintain my condition, keep up the minimal physique required to move well, and strengthen the joints. Before, I would isolate and train specific muscles, but now I am training in a way that involves my entire body. So for example, rather than using weight training machines, I do push-ups or other exercises that utilize body weight as resistance. Matsuoka: If you are no longer relying on an muscle mass and focusing instead on kokkaku, how has that changed your experience of getting hit? Yamaki: As a result of this change in focus to kokkaku, I’ve modified my posture and, with that, the position of the diaphragm. Now, my opponents’ punches deflect as though they were raindrops sliding off of a raincoat. I feel a bit of pain on the surface, but it doesn’t penetrate. Kenji Yamaki (left) showing Billy Vincenty (right) punching details. 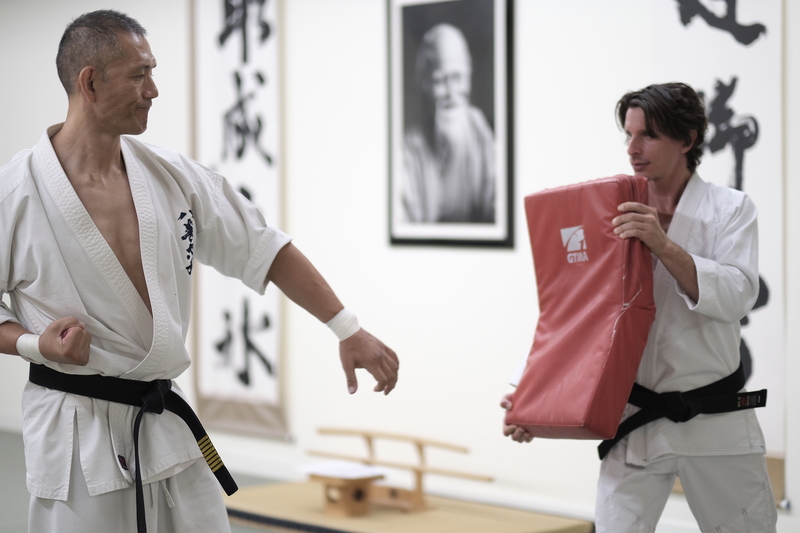 Billy, an instructor at Ikazuchi Dojo, has over 25 years karate experience and was eager to learn from Yamaki Sensei. Matsuoka: Several months ago, you led a workshop for the black belts in my dojo and you invited a couple of them to punch you. I noticed that everyone’s hand deflected right back, and nobody’s strike was able to penetrate. At the same time, I saw that if you struck anyone, even with significantly reduced power or at very close range, the result was very different. For instance, at the workshop, you showed us a strike that can be used when on the ground and defending from a mount position. Somebody was sitting on your stomach and had a pad on the side of his ribs. From that position, you struck the pad and the person sitting on you simply flew away. Yamaki: Right, because it penetrates. This is why the distance between the opponent and myself only has to be one inch. Near my dojo there is a UFC gym. My student went the other day when there was a heavyweight champion there. My student received this heavyweight champion’s punch with a pad; he said it was undoubtedly strong, but it didn’t have a penetrating effect. Matsuoka: Five years ago you mentioned to me that you felt a plateau in your weight training and power generation. Since that time, we’ve been meeting once a month at your dojo to discuss and explore concepts and exchange ideas. I’m glad I’ve been able to share some of aikido’s key principles with you and that you’ve been able to introduce me to the world of karate. I can tell that over the last few years, your punches have developed an uncanny ability to penetrate into the opponents body structure. Even from a close distance you can create an unimaginable explosion of power. I’m so honored to have been a part of your journey of transformation. Yes. 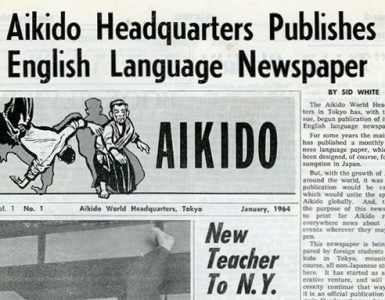 Through aikido I was able to learn how to create unity in my body and break down the opponent’s body structure. This insight was a bit of a departure from my training in Kyokushin, which is known for its repeated strikes. The person who strikes the most wins and having tolerance in getting hit is of supreme value. Since we’ve been cross-training, I’ve been trying to focus more on developing higher-quality movements and a unified body structure so I can create a more powerful effect with fewer actions and lower energy expenditure. Matsuoka: That’s right. 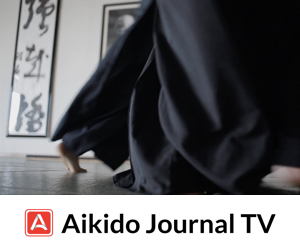 The ukemi (falling techniques) we use in aikido is essential to training the whole body; it trains us in developing the right body condition and moving in a unified way to best protect ourselves. We couple this with breathing power to break our opponent’s balance. The immediate impact that your punch creates is very similar to the kuzushi, or balance-taking, we strive for in aikido. Karate’s “one strike, instant kill” and aikido’s breaking the opponent’s balance through breathing power are complementary approaches. Our cross-training has helped me change in the quality of my movements. Since I changed my focus from muscle to kokkaku, which is more aligned with aikido’s philosophy, I have been able to do everything more productively. Matsuoka: I’ve practiced aikido for more than 40 years, but in 2004, I was struggling with my own growth. I visited a martial arts researcher named Kono Yoshinori Sensei. At the moment his sword touched my sword, it became incredibly heavy, like nothing I’d ever felt before. My sword was taken all the way down to the floor when his sword made contact with mine. However, I didn’t feel that this derived from muscular strength. Rather, Kono Sensei used gravity and unified-body power. At that moment, I realized how much I didn’t understand. Since that day, I’ve been interested in allying with gravity and giving up muscular strength in my movements. In fact, I have to give up strength in order to make use of gravity; otherwise, when you use your strength, you tense up, and the body cannot maintain balance. Not only that, you are slower, less efficient, and you send tells to your opponent who can then deflect your strikes. After we began training together several years ago, the explosiveness of your strike at the point of contact reminded me of the power of breathing techniques in aikido. Long ago, samurai never hit a sandbag to train their fists, but regardless, through atemi-waza (striking techniques) and honing their breathing power, they were able to produce explosive contact in their atemi. If you know stories of masters from long time ago, you hear that many of them were 50 years old or older but still seemed to have superhuman power. Ueshiba Morihei, the founder of aikido, was amazing, even when he was well past 50 years old. The same goes for Kunii Zenya and Takeda Sokaku. As older, extremely powerful practitioners, it seems clear that they must have mobilized something other than muscular strength. Yamaki: Yes. As expected, how they used their body and trained their body was different than conventional strength training. 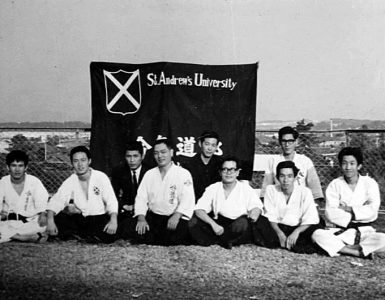 The founder of Kyokushin, Oyama Masutatsu, was able to do Okinawa Karate even as an older man. He did not use a boxing-style punch or a punch that relied on strength, but rather a punch that used the entire body as a foundation. I feel like that isn’t fully grasped by many Kyokushin practitioners. Anyways, his strike was ridiculously strong. When I was 25 or 26 years old, I witnessed something astounding. Oyama Masutatsu was around 70 years old at the time and we had an outdoor training camp where there was a tree about 60-70 cm (24-28 inches) in diameter. Everyone was gathering all their strength to hit the tree and nobody could even make a sound with their strikes. Oyama-sensei came along and showed us how to strike. He did a seiken tsuki (knuckle thrust) against the tree and we all heard a big sound from the impact and even the leaves on the tree trembled. I was astonished. Matsuoka: Yes, I see. Once I started bringing together breathing power with the body’s structural power, my techniques from the past started to change. I mean, the techniques I had been doing for decades were engraved in me as a foundation, but as I started to evolve in these crucial ways, the techniques themselves actually started to change. Did you have a similar experience? Yamaki: Yes. Unlike many practitioners who may be skillful at kata (choreographed patterns of techniques) but then have trouble putting elements of the practice into actual use, I’ve always tried to put everything in actual use. I try to find the secret within the kata and then express it within my techniques. Sparring, for example, is like the branches on the tree and kata is like the root that holds the base of the tree. By building the base you can apply it in many ways, the kokkaku can be used well, and you can freely move your center of balance. Just practicing sparring without kata won’t do anything. Every day, there is a new discovery. Rather than merely hitting this way or hitting this way, I’m interested now in trying to evolve the foundations of my practice. Matsuoka: Thank you for your time today Yamaki Sensei. I look forward to further collaboration. 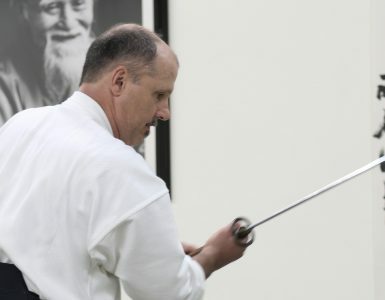 I’m delighted that someone at the highest level of the karate world has been able to use aikido principles to enhance your art, and I’m honored to be able to gain a new perspective on my aikido and my body dynamics through your karate. 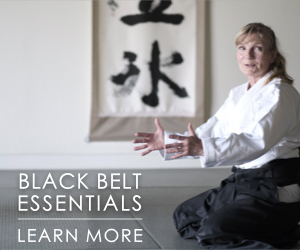 Kenji Yamaki Sensei will be leading a seminar in Irvine, CA on August 25th. Learn more here. Growth through collaboration can be so insightful. Thank you for an interesting article. Wonderful article. Thank you very much. Does anyone have specifics on the breathing methods discussed in the article? Wonderful to see such talented and gifted masters, via hard work I’m sure, set aside egos and differences in styles and enter into a world of true and humble learning by openly discussing and exploring each other’s techniques and trying new approaches. True martial artist! I see how in just one art there exists conflict, let alone walking across the bridge to a whole different art and landscape. The mind is truly like a parachute, working best when open! Much respect to them both! Great martial spirits eloquently demonstrating true humility. Osu!